Hi, my name is Tri, it is my pleasure to meet all of you here in E-space. I spent around 6 years living, studying and working in England, having completed a Master degree in Finance and at the same time having my English skill sharpened. 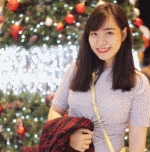 Now I am back in Vietnam and have a full time job in an international Bank, HSBC where I have an opportunity to apply my English proficiency into everyday tasks of my profession. I strongly believe that my English skill, gained through years of living overseas combined with my experience of using English in an international company will be highly relevant for English learners like you guys. During the class, I am going to ensure that my knowledge and experience will be passed on to the student in the most interesting way possible because from my experience as an online English teacher online class should be an environment where both teacher and student have a good time interacting with each other.